Teslagrad? More like Teslaglad to play this one! When Teslagrad first released way back in 2013, there was no denying it was something special. It was a game worth playing and now here we are near the end of2017 and the multi-platform Teslagrad has arrived on Switch and it is just as special as it has ever been, but just because it is a game that has made the rounds over the years (including Wii U), there are still many who have yet to experience its charms and today, we’re writing this review, especially for you! First and foremost, made with Unity, Teslagrad is a puzzle packed, 2D side-scrolling platformer developed and published by Rain Games (and Flyhigh Works for the Japanese release of the Switch version) that utilises a colourful hand-drawn art style that isn’t just nice to look at, but it is beautiful and dare I say it, positively mesmerising at some points during the game. Oh, and it just so happens to also be the game in which had its universe expanded this year, when Rain Games released its follow up title “World to the West, which to clarify, is not a sequel, but just another game set in the same universe and swaps out 2D action, for a top down 3D perspective. Oh, and just in case you’re wondering why World to the West might sound familiar, other than the reason given above, it also just so happens to be on its way to the Nintendo Switch and Wii U in the new year, but we can talk more about World to the West when we review it next year, so let’s get this Teslagrad review back on track. Teslagrad is a game that tells the story of a young boy, who back when he was a baby, was given to a woman in the night time. Fast forward a couple of years and the King’s Guard of the Kingdom of Elektropia come looking for him and with no other option, the boy does the only thing he can, and escapes into the night. Only the escape doesn’t go as flawless as it could have been and our young hero winds up having to run, jump and even scale root-tops, just to get away from the pursuing guard. Unfortunately, although the boy is successful in evading capture, he isn’t safe for long as he jumps out of the fire and into the frying pan and before you know it, he’s caught smack dab in the middle of a long-forgotten conspiracy that just so happens to involve a cruel King from long ago and ruled his kingdom with an iron fist. Before long though, every little detail about the King’s feud against the Teslamancers (Technological Wizards,) who called the Tesla Tower in the middle of the city of Teslagrad, home, will be unravelled and once exposed, there is no putting the lid back on the box. Now, while the story itself can be considered somewhat dark and serious, Teslagrad is more than just that as it can be partially light thanks to some of its whimsical graphics and soundtrack, but that’s a good thing. It just means Teslagrad is a game of some depth, substance and if that doesn’t sound like a winner to you just yet, it only means you need to hear about how it handles and the things you can do in it. Well, in terms of Handheld vs TV mode, both play out rather great and save one instance, there’s no noticeable performance issues. To explain the instance just mentioned though, the bug is something of a big one that makes the game cut out to a black screen, while audio remains and the game continues to run, even though you can see it. Thankfully you can save your game whilst in this state, as the bug is present on all versions and although it is not something everyone encounters, it is something that is there and you deserve to know about. But if room based puzzles don’t sound like enough of a challenge, there are also some mental boss fights and because a single hit can kill you, it means during the said boss battle, you can’t get hit once and until you have endured long enough to learn each boss’ pattern and beat them, you can expect to die a lot and spend more time than you would like completing a single room, when in some areas you can spend 2 minutes playing and progress through 4. So if a game with a steep difficulty is what you’re after, Teslagrad can definitely deliver on that aspect and it has 6 save files too, so if like me, you can’t get enough of it, you can of course just keep creating a new game and playing all the way through it! Or you know? Do it at least twice, as you shouldn’t regret it. I sure don’t. If time travel is indeed possible this decade, then Rain Games have already mastered it, because although Teslagrad did in fact release back in 2013, you only need to play the game for about 30 minutes to come to the realisation that Teslagrad is essentially made for Switch as it and the console perfectly complement one another! Plus it is the perfect way of getting oneself ready for World to the West’s distant, yet forthcoming Switch release. As for “Is the Switch version of Teslagrad is worth the double dip?” The answer is a resounding yes! 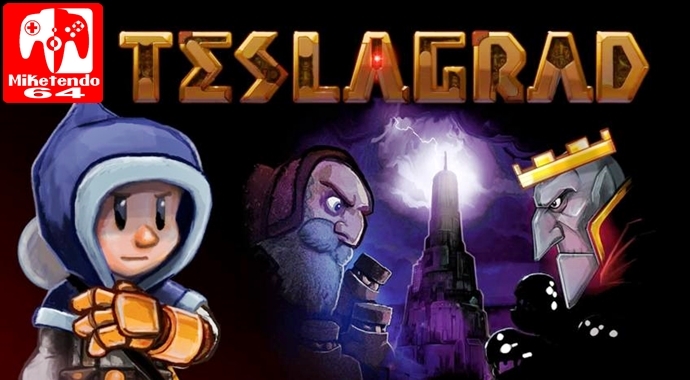 If you’ve never played it though, Teslagrad is one of the best games releasing this month that you can play on Switch, so take from this what you will, but we definitely recommend this one! Thank you for reading our review! Good luck in our Teslagrad giveaway!